You know, when we started the enlightenment and training about loan without collateral, some people could hardly believe that it is possible. This is understandable because if you have lived in a country like ours that has a lot of challenges and limiting factors, you hardly believe possibility of any thing. But in my usual ways of doing things, I don’t just like teaching or training people, I love the practical aspect of whatever we are talking about. That was what led to the birth of Loan Mentorship Forum (LMF). We started guiding members on how to access the loan without collateral. We found out that you can get money just having your personal documents like ID card, bank account details and working with others. Then without any other serious thing being asked from you, you can simply have access to fund without the usual request of collateral which is often C of O. Just this last week, some of the members of LMF got loans disbursed to them without collateral. More of our members are getting theirs this week. I hope to get some of them to share their excitement with you soon as per this. With this great news of our members getting access to fund here Lagos, we shall confidently launch the opportunity for our other members of various states, especially those in Abuja as we have more people agitating for the same opportunity at FCT. So, if you are still much interested in join LMF, click the link below and register as we bring more opportunity to you. Therefore, my people across the nation, especially Abuja people, we will soon establish your group for the loan without collateral too.Meanwhile, those LMF members that want to access fund too and want to be included in the next group we are forming should be around on Thursday, 11th April, 2019 from 10am. If you are a member of LMF, you are qualified to attend our CBN-Loan Orientation and Consultation Session. You will learn about the programme and you will also be able to be part of the next groups we are forming. Yes, the CBN-Loan Orientation and Consultation still continues. 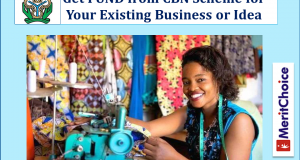 If you know you have business idea or you are running existing one then, you need to be around to know how you can benefit from this available fund. Go right away to the page below and choose a comfortable day to get the information. This coming Friday, 12th April, 2019, we shall be visiting MeritChoice Agric Villa for practical beekeeping. Yes, like I said, beekeeping and honey production is a smart investment to do in 2019, where you can be producing your own honey without need to have special workers or spending years after years to maintain your investment. Yes, this Saturday is another MeritChoice ProfitReloaded Summit (MPS). We shall have free seminar at the morning session. We shall be talking about How To Sell Internationally Via Instagram, we will discuss about Starting Your Own Mini-Importation and of course, if you don’t know that Facebook can make you money big time, Sam Nebo will be telling you what you need to know about that. Besides, he will be taking those that are interested in real practical session. You will know what you can do too. The session is just N30,000.00. If you are really interested in making millions of naira on monthly basis, this is a course you should jump into. Meanwhile, you can register for the free training with the link below and participate in all our other money-making and life-changing opportunities of the day.